The #1 cultural arts destination festival is set to be an exceptionally high-spirited, three-day family friendly, multi-cultural arts and educational event. Our festival attracts local, national and international participants while connecting the African Diaspora to our diverse communities. Past success reflects nearly 35,000 attendees visited our festival since our inception in 2010. 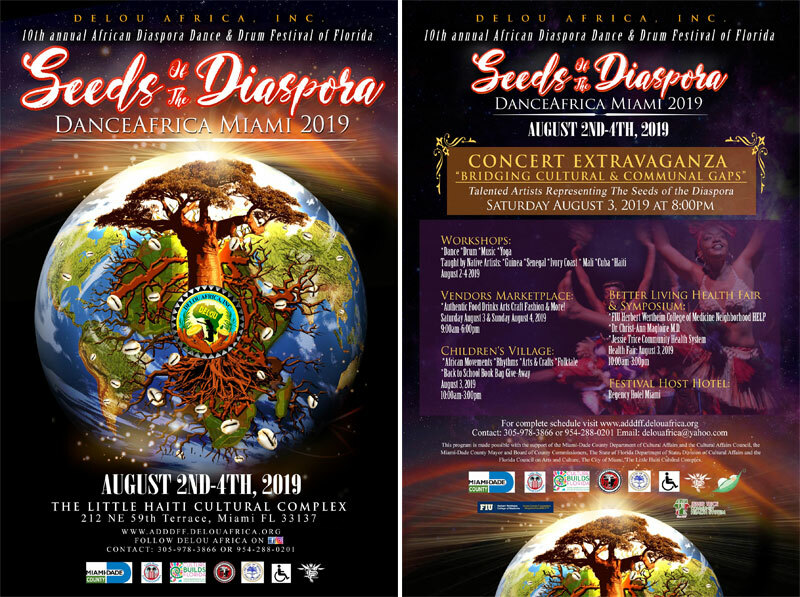 Our 2019 festival Concert Extravaganza will present “Seeds of the Diaspora”. A Journey of Cultural Artistic Expression through Traditional & Contemporary Folktale. Our concert will be held on Saturday August 3rd. at the Little Haiti Cultural Complex. This artistic collective collaboration will feature premiere and world renowned native, national and local dance, drum and music artists, groups and storytellers. All our artists will converge and perform on DanceAfrica, Miami’s main festival concert stage which is historically sold out. In addition, Delou Africa’s Cultural Community Outreach Development (C.C.O.D.) award will recognize and acknowledge key individuals who sowed the seeds that gave A.D.D.F.F. its existence. This event is open to the general public!